While the Houston Texans traded up to draft their franchise quarterback, the plan wasn't for him to see the field in 2017. That plan lasted all of 30 minutes. Taking over for a benched Tom Savage, it didn't take long for Deshaun Watson to become a fantasy stud before his season ended prematurely due to a torn ACL (Week 8). Despite the season-ending injury last season, all signs point to a recovery timeline that appears to be ahead of schedule. In his final four games, Watson finished as fantasy's QB1 or QB2 in ALL four games. Meanwhile, he scored 32-plus fantasy points in three of those four games. Over that four-game stretch, the rookie signal-caller threw for 1,171 yards and 16 touchdowns while also rushing for 145 yards and a score. Watson's dual-threat abilities provide him with a solid weekly floor and tremendous upside. Rushing for a 34/253/2 line in six starts, that per-game pace of 5.67/42.17/0.33 is the equivalent of 6.22 fantasy points per game from his rushing stats alone. Even though he missed slightly more than half the season, no quarterback averaged more fantasy points on a per-game basis than Watson (24.1). The only other quarterbacks that averaged 20-plus fantasy points per game were Carson Wentz (21.8) and Russell Wilson (21.7). The Texans have one of the league's best wide receivers in DeAndre Hopkins, who bounced back with 96 catches for 1,378 yards and a league-high 13 touchdowns last season. Since his breakout 2014 sophomore season, Hopkins has 5,063 receiving yards and 34 touchdowns, both of which are third-most in the NFL. In addition to Hopkins, Will Fuller provides Watson and the Texans with a deep threat. Fuller played just 10 games including four games with Watson under center. In those four games both were on the field, they connected for (all of Fuller's) seven (2017) scores. Watson's mobility helps to make up for an offensive line that was ranked 32nd (i.e., last) in the NFL by PFF for 2017. While they drafted Mississippi State's Martinas Rankin in Round 3 of the 2018 NFL Draft and he's a nice value selection, it would have been nice to see them add more reinforcements to the line. Either way, they will continue to have one of the league's worst offensive lines heading into 2018. That leads to durability. As is true with any dual-threat quarterback, there is a greater chance of injury by being exposed to more hits. With a leaky offensive line as well, Watson's durability risk is on the higher side even though he should be (close to) 100 percent by the start of the season. Even though Watson and the Texans have to face the Jaguars twice this year (and every year), they face the league's stingiest fantasy defense in Week 17. Since most leagues conclude their playoffs in Week 16, that second matchup against Jalen Ramsey, A.J. Bouye & Co. is excluded from our fantasy strength of schedule calculations. Based on the fantasy points allowed in 2017 of Houston's 2018 opponents, Watson has the third-most favorable fantasy strength of schedule (Week 1 to 16 opponents) and the fifth-best fantasy playoffs SOS (Weeks 14 to 16). 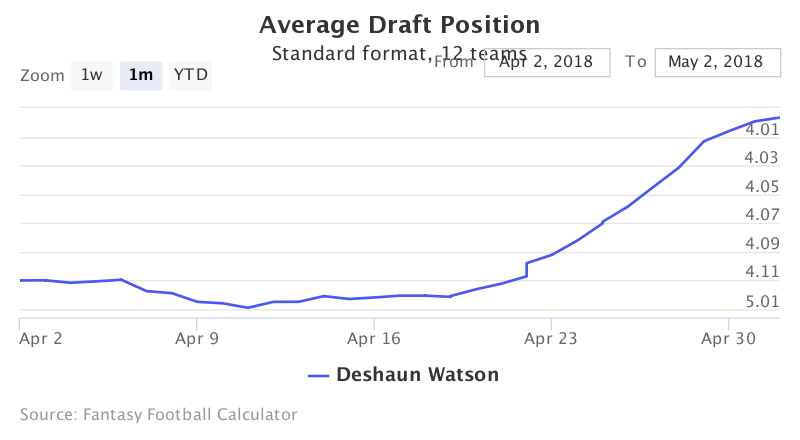 Going more than a round earlier than mid-April, Watson is currently being drafted at the end of Round 3. In general, the challenge with drafting a quarterback early is the missed opportunity to draft an impact player with greater positional value. Only Aaron Rodgers (3.01) is being drafted earlier than Watson (3.10, 35th overall). Russell Wilson (47th overall) and Tom Brady (50th) are the next QBs off the board. In general, QBs drafted early will get the "overvalued" tag from me given the opportunity cost of missing out on an elite running back or wide receiver that has greater positional value. Due to Watson's recent surge in ADP to late-Round 3 (via FFC), much of his legitimate QB1 upside has been priced into his ADP. I'd much rather use a top-36 pick on an elite non-QB and target Carson Wentz in Round 7 (current ADP) or even wait much later and stream QBs based on matchup.